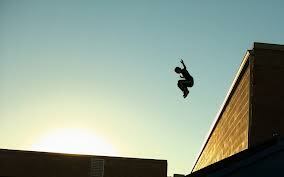 Parkour is an art form that does not conform to social expectations. In the eyes of a traceur (a parkour practitioner) stairs, walls and rooftops are not physical boundaries but instead they offer options to the individual – options for an alternative way to travel through an urban landscape. In Lamb’s article, he explores the misuse of public space and asks whether parkour can be a practice of empowerment that challenges spatial expectations of use. This art replaces restricted, conventional uses of city spaces with creative, free-flowing and playful movements, which challenge social expectations of use. Both parkour and the environment it is practiced in operate on a strong philosophical mind-set. Architecture is often designed to regulate, control and discipline human behaviour, in as much that it can direct the flow of pedestrians and traffic and influence emotions of those that pass through or use that space. Unlike rural areas, which allow the individual to roam with relative freedom, urban spaces restrict movement. Architecture also has the capability to embody history with monuments and other structures that reflect the past or symbolise power of the establishment, or even physically represent cultural values. How these specific urban spaces are interacted with are particularly formal. When crossed with parkour, it is not surprising conflicts may occur. The main empiric of Lamb’s study was to apply parkour in a public space that would be suitable to challenge expectations of usage and to explore the notion of the misuse of urban spaces as a form of empowerment in authoritatively restrictive environments. 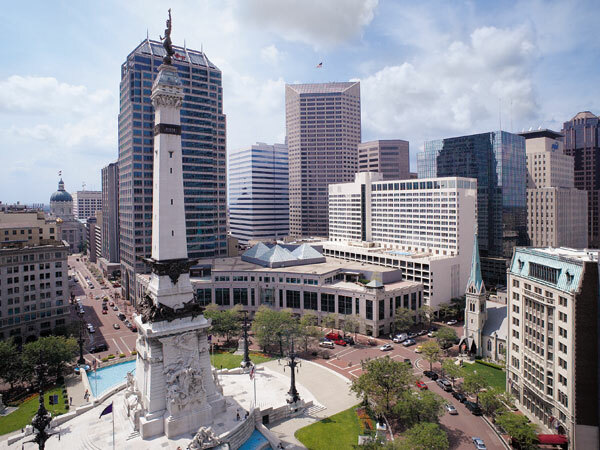 The space identified for the study was the Monument Circle in Indianapolis, which was erected to represent Indiana’s history of war and peace. Although it initially intended to commemorate ordinary soldiers, it pays homage to four major areas of the state’s history; namely the Revolution, the War with Mexico, the Battle of Tippecanoe and the Republican politician Oliver P. Morton. Lamb highlights that, ‘as with any architectural project, Monument Circle is imbued with codes of power communicating to a whole host of users’ (Lamb 2014). As provoking as it sounds, it appears this would be a perfect setting to test Lamb’s notion. As the jam (a meeting of traceurs to practice parkour) unfolded at The Monument, the following extract from the article illustrates the outcome. We started to follow Cat (the leader of this exercise) by climbing up the wall after him. It was then we heard, ‘Aren’t you all a little old to be playing in the fountain?’ I was still climbing so I only heard the person shout. Once I made my way up to the top I saw that Cat was already talking to the police officer that had asked the question. Police officer: What do you think you’re doing out here? Police officer: Whatever it is we’ve got some complaints that you all shouldn’t be out here and are bothering people. Cat: We’re just practicing, so it’s cool. Police officer: It’s actually not. I know you’re not going to hurt anybody, except yourselves. But, I have to ask you all to take it somewhere else. Cat: We’re not doing anything illegal. I mean what’s the difference in sitting on it and walking on it? Police officer: Doesn’t matter. You’re not allowed to do it. So take it somewhere else. Besides you all are old enough to know you shouldn’t be out here playing around like that. The free-flowing movement of parkour seems to be very easily and all too readily dispelled by the authority supervising, or even policing, such public spaces. Parkour, after all, is a developing art and these types of struggles and conflicts are opportunities to explore the limitations of this art form and to further our understanding of how urban spaces, and the alternative attitudes towards their usage, can be considered and practiced. Tags: Indiana, IQ magazine, parkour, The Monument, urban cultural studies, urban spaces. Bookmark the permalink. Reblogged this on Parkour .